The need for the energy sector to adapt to climate change has resulted in the need for solutions that will restructure the current electrical power system into one that is more resilient, sustainable, and efficient. A high priority within this effort is to significantly increase the penetration of renewable distributed energy resources (DERs) within the power system, which will not only decrease greenhouse gas emissions (GHGs) but also provide a layer of resilience and energy independence to electricity consumers. However, the intermittent nature of solar and wind-based DERs can cause severe destabilization issues within the grid and has hindered their large-scale deployment. 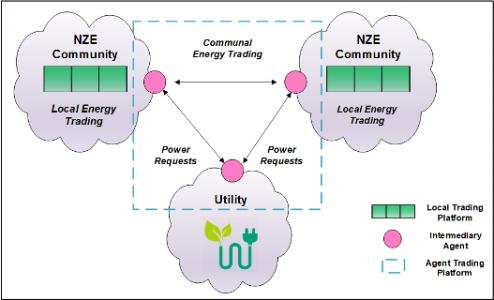 Transactional Energy Frameworks (TEFs) are a relatively new concept that can address this concern and assist electrical grids with adapting to climate change. In a TEF, energy producers can be directly linked to neighbouring energy consumers, allowing producers to sell/transfer their energy to local consumers via a credit based system. TEF participants thus know exactly where each watt of power within the system is coming from. The peer-oriented ethos of the TEF promotes the active engagement of all energy stakeholders to work together towards a common goal. This project is undertaken with support from Natural Resources Canada through Canada’s Climate Change Adaptation Platform Energy Working Group.